Audi is a demonstration that banging your head against a brick wall for long enough can, very occasionally, bring the wall down – so long as you are prepared to stand there for 20 years getting a bad headache. When VW bought Auto Union from Mercedes, of all people in the mid 1960s, VW wanted it mainly for its production facilities – it could see little future for the cars. The first Audi was simply a re-engined version of the long-forgotten Auto Union DKW F102 (catchy name, huh?) and was meant to be the first and last Audi of the post-war period. 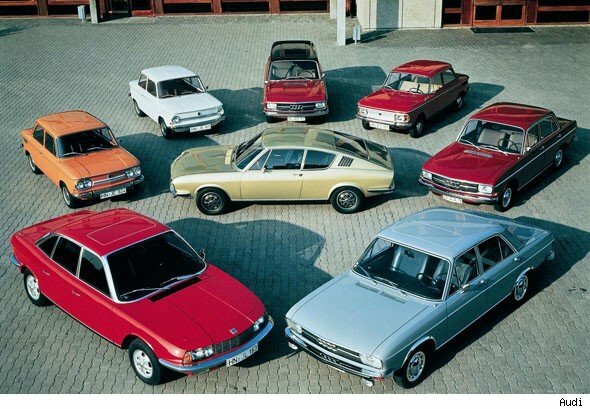 However, Audi engineers secretly developed the first 100 model against VW's orders. When the VW boss saw the result, he changed his mind and allowed Audi to continue with both the 100 and the subsequent 80. In fact the first VW Passat was simply an Audi 80 with a hatchback body – the engineering all came from Audi. However, Audi was seen at least one rung below BMW and Mercedes – a bit dull, a bit plodding, a bit downmarket. Audi tried to use technology to show how clever it was, with the 1980 4wd Quattro, the 1983 super-aerodynamic Audi 100, and the pioneering use of aluminium. However, the public did not really care. Audi did not have the image of a BMW or Mercedes, and no amount of Vorsprung durch Technik seemed to change that fact. In the 1990s, Audi changed tack. It did two incredibly simple things that made a huge difference. It separated its dealers from VW, as it slowly realised that nobody would ever walk past a VW Polo to buy an Audi V8. Secondly, to underline its separate identity, it ditched its 1970s-era names in favour of A4, A6, A8 etc. It sounds laughably trivial, but people did really think the Audi A6 was a new car, not a rebadged Audi 100. The third thing it did was a bit more complex – it majored on design, not technology. The cars looked more sophisticated and the interiors were massively improved, to the point where Audi interiors probably became the best in the industry. Suddenly buyers could see the benefits of Audis, just by sitting in the showroom and prodding the dashboard. That was a lot more persuasive than a 10 minute lecture on aerodynamic efficiency. As the old saying goes: if you want to persuade someone, show, don't tell. Audi then used its growing success to colonise every niche it could think of – A3, A5, A7, TT plus the ever-expanding Q range (at last Audi found a way of profiting from its 4wd technology). It is now running neck-and-neck with BMW, but has one huge advantage. A lot of the oily bits still come from the VW parts bin, which gives it economies of scale that other premium brands can only dream of. BMW can share a few bits with Mini, but that is hardly the same as sharing with the multi-million-selling VW Golf. In order to underline its new status, Audi has become the leading power in sports car racing in recent years. It is no coincidence that this form of motorsport was dominated by Porsche for much of the period from 1970 to the beginning of this century. Porsche was (and still is) the premium sports car company, so taking over from Porsche in its motorsports home sends the message that Audi is not only the new BMW, it is the new Porsche as well. Audi's skill was to build on its Le Mans success with the R8 supercar – a car that looked like it could compete at Le Mans (and if you want to see what's so speecial about Le Mans, watch this short video). 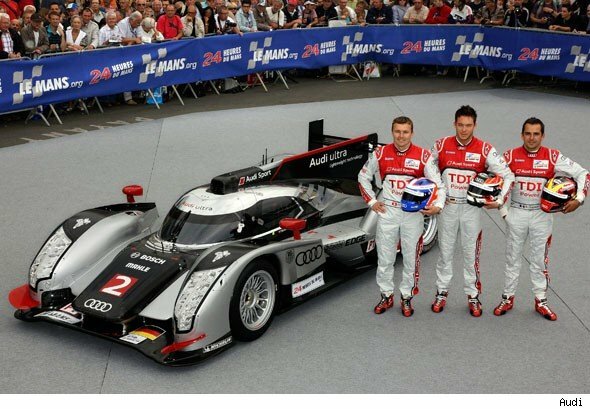 The Le Mans racers gave the R8 credibility which, in turn, gave other Audi road cars credibility. It sounds simple, but no other car company has managed the trick. Both Peugeot and Mazda have won at Le Mans, but it never really did them much good, because they never had road cars that could credibly compete with the likes of Porsche. Audi is the only car company that has successfully joined the ranks of supercar manufacturers since Ferrari and Lamborghini established the breed. Others have made limited-edition models like the Jaguar XJ220, but of all the would-be entrants since 1970, only Audi has made a successful series-production supercar. Even BMW's attempt, the 1970s M1 failed (albeit due to factors largely beyond BMW's control). 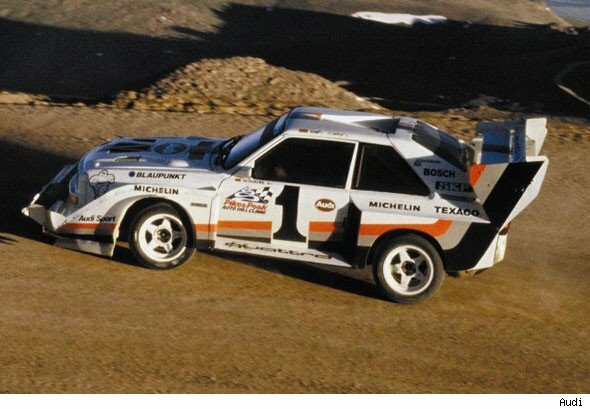 But what of Audi's rallying heritage? The VW Group, Audi's parent, has not given up on rallying, but it has decided that Audi is not the right brand. From 2013, VW will be competing in the WRC (World Rally Championship) in order to make the Polo look a bit more sporty, given it has a rather staid image at present. Audi has the A1, which could have been turned into a rally car (under the present regulations you pretty well have to start off with a supermini-sized car), but Audi reckons that its motorsport activities should reflect the car at the top of its range (the R8), not the car at the bottom. The fact is that Audi has now joined the elite club of globally credible mainstream premium brands – and that club only has four members: the three German brands plus Jaguar Land Rover. As premium brands take an ever larger share of the global car market, that means each one makes ever larger profits. All of them currently have a profit margin of over 10%, which is more than double the typical margin of a non-premium car maker. The best news is that you can't choose to enter that club – Renault can't wake up one day and decide to be premium, as only the market makes the decision to allow in new entrants. Just ask Audi – they spent 20 years trying to climb in and made it just in time to enjoy the global premium boom. They are going to work very hard to kick the ladder away from any other manufacturer that tries to follow them.